Private institution that promotes the Spanish language and culture throughout the world. Study, learn and practice Spanish in the best entity dedicated to the teaching of the Cervantes language in Spain. The Fundación para la Difusión de la Lengua y la Cultura Española (The Foundation for the Spanish Language) is a private institution created in Spain that deals with the promotion of the Spanish language and culture in non Spanish speaking countries and spreads the image of Castilla y León worldwide. We offer you the opoortunity to learn Spanish in one of the most important institutions in the teaching of Spanish, with professionals teachers. In the following sections, the Fundación para la Difusión de la Lengua y la Cultura Española offers information and educational materials for all those who wish to use them in a generalised way and free of charge. "Guess it!" 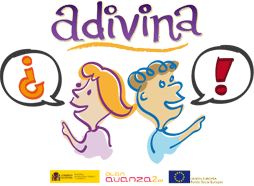 is an audiovisual dictionary that describes the Spanish lifestyle through Spanish children´s eyes. We provide it as a support tecnique tool, focused on an amusing methodology to learn the Spanish language in a non-conventional way. Se cuelgan en las perchas. Se puede llevar un estuche. Escucha con atención a estos niños e intenta adivinarlo.